Not anywhere near as difficult as people think it is to make! Place syrup ingredients in a saucepan and stir over heat until sugar dissolves. Bring to a boil, reduce heat, and simmer for 10 minutes. Strain out solids and return syrup to pot. Melt the butter and cut a piece of parchment for the bottom of a 9 x 13 baking dish. Use a pastry brush to coat the top sheet and the sides of the dish with butter. In a bowl, combine the nuts, sugar, and spices and set aside. Unroll the phyllo and place on a piece of plastic wrap. Cover with another piece of plastic wrap and a damp towel. Place 3 sheets of phyllo in the dish, recovering the rest of the stack. Brush with butter. Add 3 more sheet and brush with butter, repeating until about half the phyllo is gone. Spread 1/2 the nut mixture, top with three more sheets, butter the top, and spread the other 1/2 of the nut mixture. Continue stacking 3 sheets of phyllo and brushing with butter until you run out. End with butter. With a sharp knife, cut through all layers: 6 lengthwise strips and then 6 crosswise strips. Bake at 350 for about 35 minutes until golden brown. Cool on a wire rack. 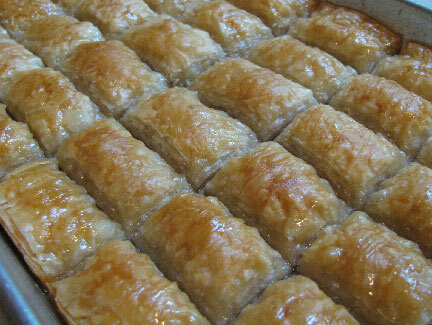 When the baklava is cool, reheat the syrup and pour hot over the pastry. Let it stand for at least 3 hours at room temperature before serving. If it's done right, you can eat it with a spoon! Set out the meat for about 1/2 hour and let it dry and warm up. 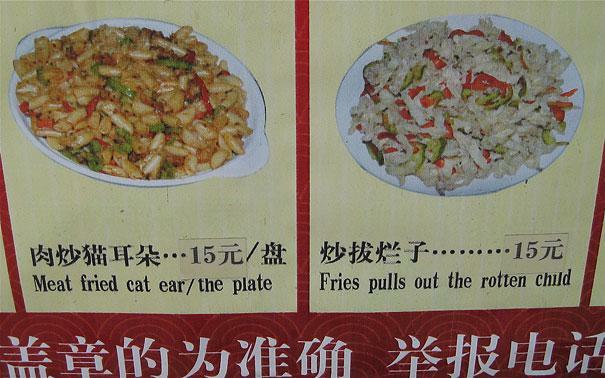 Salt and pepper it generously. Preheat the oven to 300 with the rack in the middle-low position. Slice up the onions and garlic and set aside. 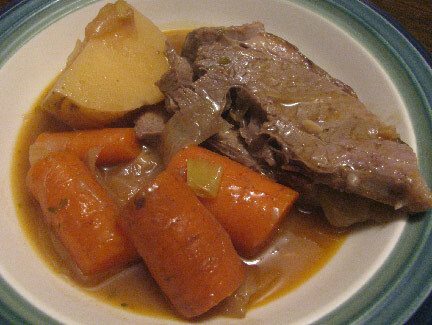 In a Dutch oven, brown the meat over medium-high heat until well browned, about 5 minutes per side. Place the meat on a plate and set it aside. Lower the heat to medium and cook the onions along with the tomato paste and sugar until onions are soft and beginning to brown, about 10 minutes. Stir in the garlic and flour, and cook for about a minute, stirring. Stir in the wine to deglaze the pot; cook until almost completely evaporated, and then return the brisket to the pot, on top of the onions. Add the broth, bay leaves, and thyme, enough broth to come up 1/3 to 1/2 way up the sides of the meat. Bring the broth to a simmer, cover with foil and with the lid, and stick it in the oven for 3 to 4 hours. Add the vegetables around the meat, submerging them as best as possible for the last 1 1/2 to 2 hours of cooking time. 1. Transfer the brisket and vegetables (not the onions) to a platter, tent with foil, and let it rest for at least 10 minutes. Place the pot on the stove top, add 1 T cider vinegar and bring to a low boil to reduce the sauce somewhat, about 5 minutes, fishing out the bay leaves and thyme. When the sauce is reduced enough, slice the brisket, arrange on the platter, and pour the sauce over. Serve onto plates. 2. Or, transfer the brisket and vegetables (not the onions) to a platter, and tent with foil. Let it rest for 15 minutes, and then slice. Place the pot on the stove top, add 1 T cider vinegar and bring to a low boil, fishing out the bay leaves and thyme. 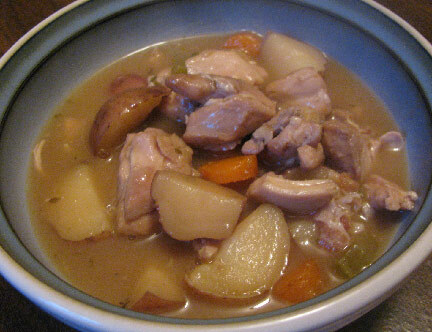 Place the meat and vegetables back into the sauce and serve directly from the pot, probably into bowls. 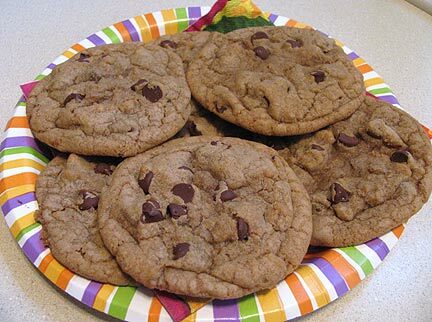 Recently I made a batch of my monster chocolate chip cookies, shown below, and it occurred to me that some of my other recipes could probably be adapted to make over-sized delights like these. 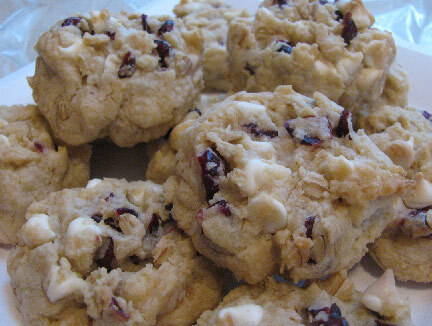 I started my experiments with my recipe for Cranberry-White Chocolate Cookies, and it worked out so well that I think I'll probably try it again with other recipes! 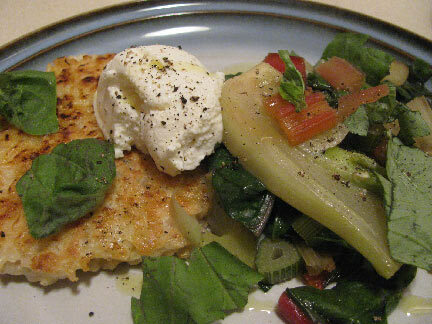 Start with the basic recipe at the link above, and make these four adjustments. Melt the butter and let it cool before beating with the sugar, add an extra egg yolk, lower the oven temperature to 325, and form and bake them according to the directions for the chocolate chip cookies. When I first saw this recipe, I thought, "Well, maybe..." And then I promptly set it aside for a couple of years and forgot about it! Recently I found it in my "to try" file, and thought, "Well, maybe..."